Each application and environment is unique, however, we have developed a unified methodology that addresses the requirements of web application security testing. Our approach is based on the latest version of the leading web security industry standard OWASP Testing Guide complemented by our own proprietary security testing process. Web applications may inadvertently disclose information that is useful to the attacker by means of verbose response headers, error messages etc . or by using common conventions, such as an admin interface being located in “/admin/”. Furthermore, some of these error messages may be cached by search engines long after the message has been remedied in the application. The first phase in a security assessment is focused on collecting as much information as possible about a target application. A secure web application must be deployed on a secure infrastructure. In this control area, the immediately supporting infrastructure is analysed for various misconfigurations that can give an advantage to the attacker. For example, if application is deployed on top of a web server, does it use file extensions (.php, .aspx, .jsp, .pl) to handle dynamic programming? If so, then possibly by uploading a file with such extensions, could allow attackers to take over the web server and circumvent the application security. Almost every web application requires some form of user authentication (establishing identity of the user) to provide additional functionality. For example, to alter content in a content management system, administrators must authenticate themselves. 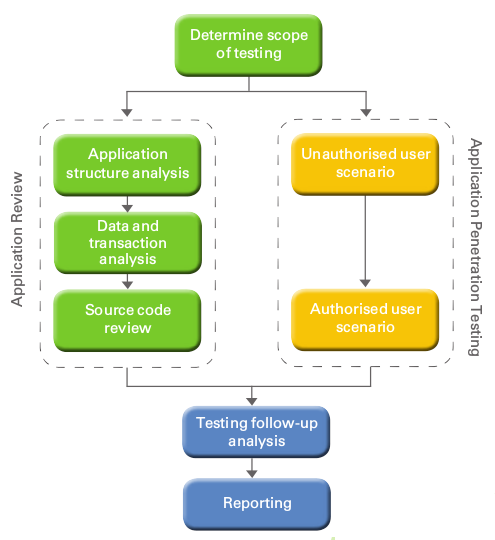 Authentication mechanisms are inspected in detail to examine the possibility of altering or intercepting authentication data to gain additional access to the system. For example, common usernames and passwords are checked, such as admin/admin. HTTP is a stateless protocol and does not have a concept of a user’s session built-in. In order to avoid continuous authentication for each page of a website or service, web applications implement various mechanisms to store and validate credentials for a pre-determined timespan. These session mechanisms are subject to common risks and flaws that may lead to unauthorised access to additional functionality or can be abused to force users to unwillingly and unknowingly execute an action in the system using social engineering tricks. For example, a common error is to rely on usernames stored in a browser cookie in a way that can be easily manipulated by the attacker. Each purpose-built web application will have a specific set of requirements and restrictions specific to the business environment it operates, for example, a junior employee may not authorize transactions over a specific sum or may not authorize transactions where he/she is the initiating party to preserve segregation of duties. To conduct business logic testing, the analyst first builds an understanding of what specific business rules and restrictions must be in place and then attempts to bypass these restrictions using a variety of tests, such as form field tampering, forced browsing etc. Web applications must accept only valid data, e.g. only valid dates, no spaces in e-mail, only plain text in comments areas. If such checks are not enforced, attackers may hijack the execution flow of the program, for example by inserting a portion of a SQL statement in a lookup query that uses user-supplied input. In such a scenario, instead of specifying first name like “John”, attackers may input “John’ OR 1=1;–’ and possibly obtain output of all users in a directory that may be otherwise unavailable or use this to extract data from other tables or gain a foothold in the underlying operating system. In this control area, we check if correct user input syntax is enforced and if not, what can be gained from abusing weak data validation functionality. opponent’s information resources are overloaded to prevent dissemination of information. Common errors include improper syntax validation in search fields, allowing wildcard characters, such as “%” in SQL queries to be included which may cause the database server to retrieve all rows from a table. If the table is large, then effectively all other users might not be able to use its functionality as it will be busy serving the computationally-expensive request issued by the attacker.